REMARKABLE CUSTOM HOME! Nearly 6,000 sq ft. of living space with 3 bedroom and 3 1/2 bath and fully finished lower level. 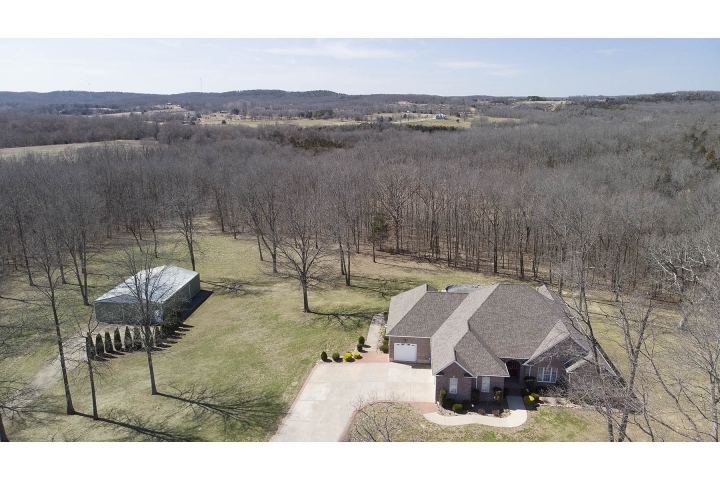 This beautiful home is on a 3.1 acre lot outside of city limits, is full brick and has 2x6 exterior wall construction. Arched doorways with attractive millwork & hardwood floors throughout. Spacious gourmet kitchen with center island, granite counters, tile backsplash, breakfast area, & upgraded stainless appliances. Formal living has gas fireplace & attractive built-ins. Large master suite offers coffered ceilings, private door to the screened porch, and a master bath to die for! Glass enclosed shower with wall AND overhead showerhead, separate freestanding tub & double vanities. Additional bedrooms also each have their own ensuite bath! Finished basement with family, rec area, safe room, bath and additional sleeping area. Outdoors you'll find large outbuilding, well-cared for above ground pool, and stamped concrete patio with a fantastic pavilion. Amazing entertaining space!